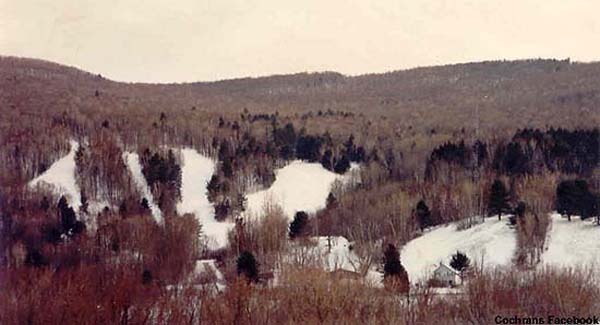 Located southeast of Burlington, Cochran's ski area has been the launching pad for numerous young skiers for over half a century. Cochran's ski area likely dates back to the 1960-61 season, when General Electric employee Mickey Cochran built a small rope tow ski area for his family in their backyard. Before long, the area became popular amongst local kids. Circa 1965, the Cochrans purchased a 140 acre lot adjacent to their home and expanded the ski area the following year. Over the next half decade, all four of the Cochran children were named to the United States Ski Team. Numerous gold, silver, and bronze medals were won by the family in a variety of events, such as the World Cup, World Championships, and, Olympics in the late 1960s and 1970s, giving the small ski area quite a name. Mickey Cochran took over as the Alpine Director of the U.S. 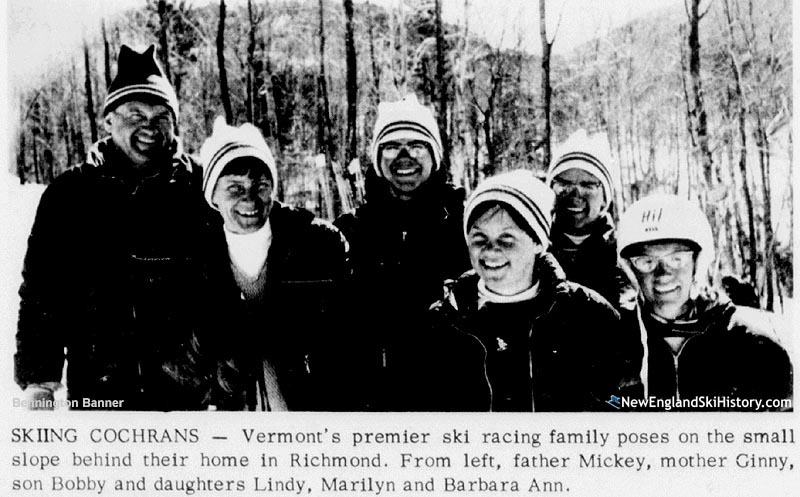 Ski Team in 1974, whilst his wife Ginny continued to manage the ski area. Uphill transportation was upgraded in 1979, when a used 1,600 foot long T-Bar was installed. Snowmaking was expanded to cover 70% of the ski area for the 1982-83 season. A new lodge was constructed circa 1984. Mickey Cochran passed away in 1998, triggering changes at the ski area. Following his death, the non-profit Cochran's Ski Area, Inc. was formed, procuring a 49 year lease to operate the ski area. Ginny Cochran passed away in 2005. A new $400,000 snowmaking system was installed for the 2007-08 season. Night skiing was added for the winter of 2010-11. Cochran's Ski Area continues to operate to this day with the Cochran children and grandchildren still playing an active role.